Aquebogue, Long Island, October 23, 2005 - Even though the leaves haven't changed much here yet, Sunday was still a beautiful crisp fall day - much lovelier than Saturday, that's for sure. 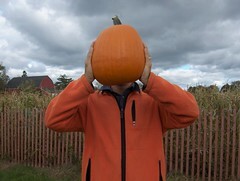 So we drove out even farther on the Island to hang out in a pumpkin patch with my family. It was my nephew's first pumpkin-picking experience (he's almost two), and we think he enjoyed himself (he didn't say), but not nearly as much as my parents did. Toddler + pumpkins + wheelbarrow + camera = really happy grandparents.